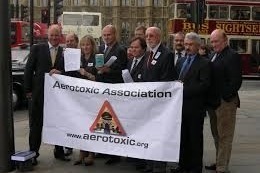 The Aerotoxic Association Ltd was founded at the Houses of Parliament, London, UK on 18th June 2007 by former BAe 146 Training Captain John Hoyte to assist other sufferers and survivors of Aerotoxic Syndrome. The avoidable, acute and chronic public illness was first identified in 1999 by a US doctor and scientists from France and Australia and which affects globally countless aircrew and passengers. The illness is known by the media as ‘The Asbestos of the skies’ and valued at many billions of dollars. Over the past twelve years, the Aerotoxic Association has maintained www.aerotoxic.org to assist other members of the public understand the cause of their mysterious ill health by Aerotoxic Poisoning – For example the 60 + passengers (including children) who were Aerotoxic Poisoned on 1st February 2007 on Boeing 767 flight XLA 120, but who were then let down by most so-called ‘media’, lawyers, doctors, scientists and politicians who still refuse to recognise the known and available technical solutions of this ongoing public Aerotoxic cover-up. Poisoning can occur on ANY bleed air system flight, apart from the redesigned Boeing 787. In recent years, as previously fixed deadlines have slipped, the website has become challenging to manage as no money is left now to finance a rebuild after spending around £200K over 12 years. Financial help is now requested to maintain this dedicated public service and continue the pressure on airlines and manufacturers – such as Easyjet and Pall Aerospace to introduce all of the known solutions as rapidly as possible and in the public interest. · Provide an effective, vibrant self-funding public membership scheme. · Continue to publicise inconvenient evidence, which is in the public interest. No public funding has been available to help with this little-known public health scandal – all backing must come from generous donations or in exchange for vital H&S information – all in the public interest. Governments still claim that there is ‘No Positive Evidence (sic) of Aerotoxic poisoning’. Thank you for your past invaluable support – never, ever, give up!! Integrity cannot be bought.